Eating healthy takes time and preparation. Planning out meals ahead of time helps eliminate those quick, unhealthy food choices you make when you’re crunched for time. By taking time to plan and prep meals for the week, you can ensure you and your family are eating healthy and save time and money. 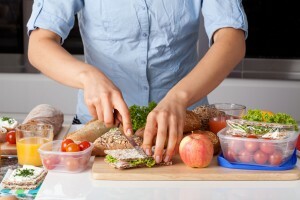 Does the thought of prepping meals for a whole week overwhelm you? Use these tips to simplify the meal planning and prep process. Designate a day for meal prep. Meal prep takes time, but it will also save you time. Set aside a specific day and time each week to plan your meals for the coming week. As much as possible, keep the same day scheduled for meal prep each week so it becomes part of your routine. Choose your menu. Start by making a list of your family’s favorite healthy meals. To save money at the grocery store, look at what food you already have in your fridge and pantry when planning your menu. Write down what you will eat for each meal and snack for the week, taking into consideration any meals that may be provided for you (breakfast at school, dinner at a friend’s etc). Meal prep is all about making meals in bulk. Pick two to three lunch and dinner options for each week so you won’t get bored eating the same meals all week. Save your menu to add to your meal prep menu rotation to spare you even more time in the future. Make a shopping list. Going to the grocery store with a list in hand is the best way to avoid buying things you don’t need, such as junk food and extras that will run up your shopping bill. Look at your menu for the week and make a list of any items you’ll need to prep your meals. Stick to your list and avoid impulse buys. Think simple. Keep snacks, breakfasts and even lunches simple. Fresh fruit and veggies, hummus and hardboiled eggs are all quick and easy foods you can set aside for snacks and light meals. Purchase baggies or small plastic containers to portion out snacks for each family member for the week. Get creative with your muffin pan. Muffin pans can be used for everything from baking eggs (the alternative to hard boiling) in the oven, to freezing premade smoothie blends and preparing mini breakfast casseroles or frittatas (try these recipes) for the whole week. To make hardboiled eggs in the oven, preheat oven to 325°, then bake eggs in a muffin tin for 30 minutes. Carefully remove eggs and soak in ice water until cool. Make use of mason jars. Small mason jars are the perfect portion size for overnight breakfast oats (try these tasty recipes) or salads for lunch. Mason jar salads are the best way to prep salads ahead of time without them getting soggy. Layer your salad, starting with the dressing on the bottom. Nuts and sturdy vegetables go next, followed by protein or fruit, and finally topped with greens. Fold a paper towel and place it just under the lid to absorb any extra moisture. Fill up your oven. Cooking food for the week is the most time consuming, but you can actually knock most of it out at once. Roasted veggies, potatoes and chicken can all go in the oven at the same temp. Simply keep track of cook times for items on each rack. Get any food that has to be cooked into the oven before spending time making salads or portioning out snacks. If you’re trying to eat healthy and want to save time and money, meal prep is your ticket. It takes some organization and commitment, but once you’ve got your meals planned and prepped for the week, you won’t have to worry about the last-minute scramble to feed the kids breakfast or get dinner on the table when the hustle and bustle of the week begins.